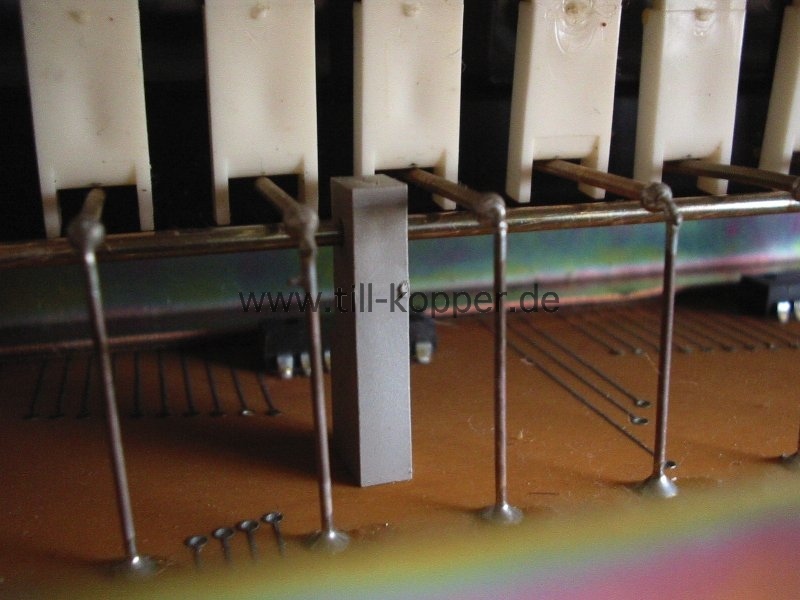 This german early eighties string keyboard was one of the last variations on building a string ensemble keyboard with or without some extras added. as full polyphonic sound sources. Addtionally a bass sound can be activated for the lower two octaves. The keyboard is split in two plus three octaves. And each half can get a unique combinations of the above named sounds. Don't expect too much. These are very simple synth sounds and each and every synth today could make much better ones. The character of these sounds is very boring and is missing something special. To open the top you just need to unsrew 3 screws on the top. You see the two leather handeles left and right the keys? You need them to lift off the keyboard with all electrinics after you undid the 4 screws on the bottom plate of the instrument. Here you see the main frame lidted off the lower instruments housing. This way you can get to all parts very easy. The bottom side of the frame with 12 brown PCB board for the filtering of each sounds. Each board covering one note of a scale in five octaves. 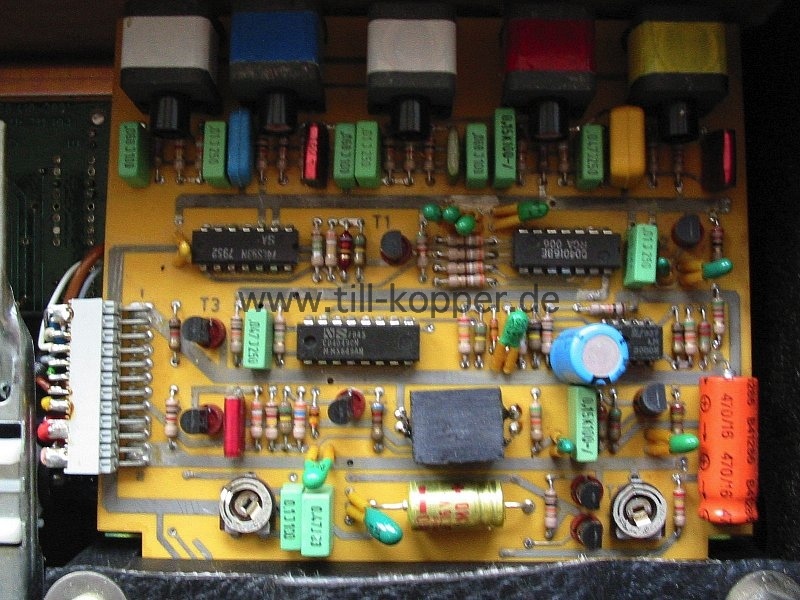 There are little differences in the values of the capacitors on each board. Here you see the solo synth steering and one of those brown boards. 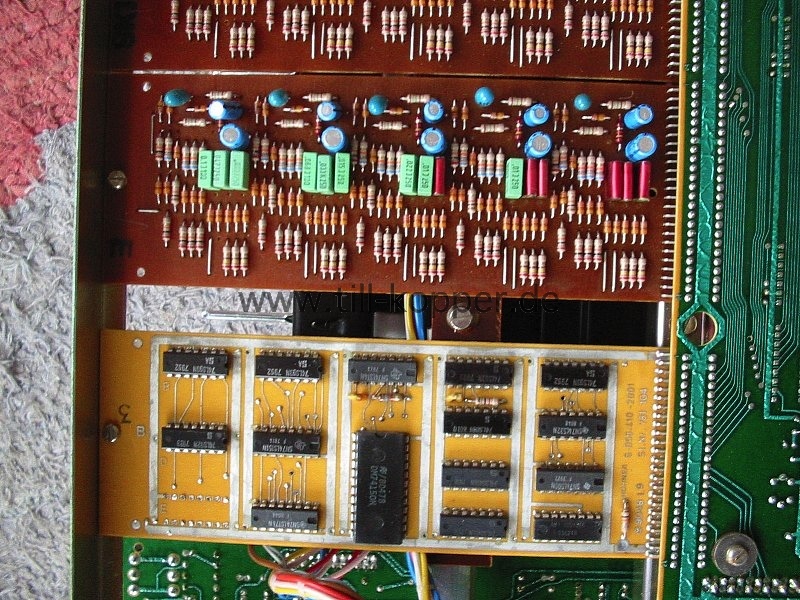 The top oscillator, the top octave divider ("S50240") and the octave dividers ("4024 7-stage binary counter", and "4011 1 Quad 2-Input NAND Buffered B Series Gate"). 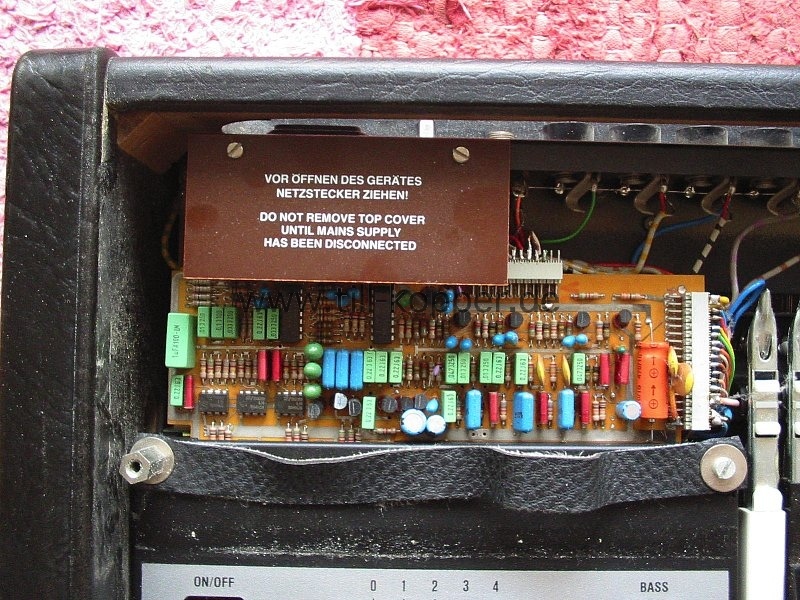 The discrete main oscillator is feed into a S50240 chip ("13-Note Top Octave Synthesizer IC 50% Duty Cycle Output", "... draw considerably less current, ran cool and needed only a single positive voltage supply") to divide down the main oscillator to the 12 notes of the top octave. This is the FX section with the three transistor bucket brigade delays. This gives the ensemble FX that is used on most string keyboards. But here it is using a bit newer chips, the TDA1022, then the famous TCA350 one found in all those italian string machines. And finally the single board of the monophonic synth. The coloured trimmers are variable capacitors. They might ajust the filter presets of each synth preset sound. The synth is very pitch stable btw. But you may have to adjust the course pitch with the trimmer pot on the left. The right hand trimmer adjusts the vibrato frequency. The volume of the mono synth section is usually way higher then the rest of the keyboard. The ON/OFF switch is next to the mains in.